Fireplace stone choices for your log cabin hearth vary widely and you need to consider several aspects as you make your selection. You can transform an ordinary space into a stunning, warm retreat using the texture and elegant beauty of stone. The stone you choose to use can be a dramatic and unique display of shadow lines, depth and texture for your log cabin decor. First and foremost is the choice between real stone straight from nature, and cultured or man-made stone, also known as stone veneer, artificial stone and manufactured stone. There are pros and cons to either choice for your cabin fireplace and we’ll talk about each one. Artificial stone is a Portland cement-based product made using special molds and high-quality, long-lasting permanent pigments. Instead of stacking the stones as you would with natural rock, the artificial stone is essentially glued onto the wall using a cement stucco mixture that is rich in Portland cement. The most significant difference between real and manufactured stone is the weight. Manufactured stone can be 1/6 or 1/7 of the weight of natural stone – and this can add up to significant cost savings in transport and installation. 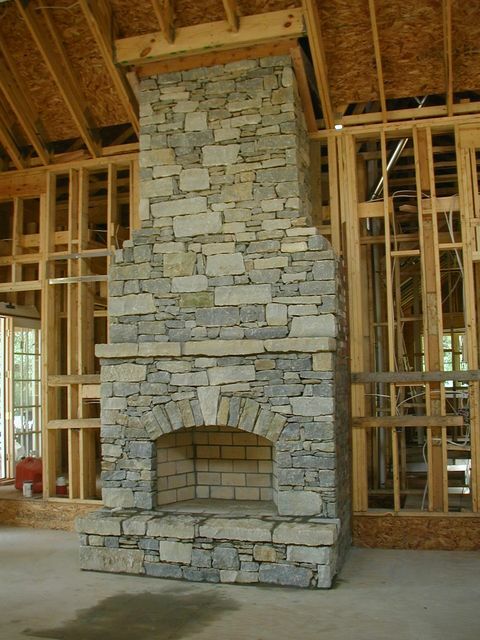 In addition, stone veneer or artificial stone-faced fireplaces do not require full masonry foundations to support them and can often be added to your log cabin after it has been built, saving you even more money in labor and materials. Manufactured stone is often quoted as being cheaper than real stone. While this can be true, it’s not always the case. Western North Carolina is an area with abundant natural stone and local quarries supply other parts of the country. As a result, natural stone is cheaper to buy as a raw material. 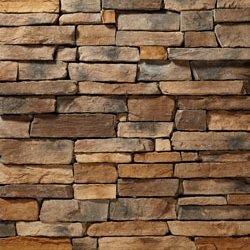 In other parts of the country stone veneer can be half the price of natural stone. To stone-face a typical log home fireplace requires 80 – 100 sq. ft. of stone. Our local stone yard sells pallets of stone for approximately $280 – 300. One pallet will cover 2 or 3 fireplaces. Local delivery charges are $60 for a truck, whether it’s for 1 pallet or 4 pallets of fireplace stone. If you have access to natural stone you can gather your own and hand-pick your choices. Be careful of soft stone that’s been immersed in a river. It can hold water that can later boil from the heat of the fire in your fireplace, causing the rocks to crack or even explode as the water turns to steam. Make no mistake: it’s hard work installing a stone face on a log home fireplace. Using the lighter manufactured stone will save time and effort. Back butter the stone. Then press it into place, twist the stone to settle the mortar and hold for 15 seconds. This helps to make the stone stick in place. If the stone falls off, the mortar mixture may be too dry. The hydrated lime in the mix makes it sticky and improves its workability. You may need to lightly mist the stone and/or wall to keep it from wicking all the moisture out of the mortar mix. Start from the top and work down to keep dropped mortar from messing up your finished rock face below. Use screws driven into the backer board to help support the large stones until the mortar sets up. Then remove the screws and cover the holes when you come back to mortar the joints. For more detailed instructions on applying a stone face to a framed fireplace, see our page on framing a stone fireplace. Gone are the days of fake-looking stone veneer. Once installed, it’s difficult to tell manufactured stone from real stone. Artificial stone is available in styles that mimic rounded river rock, flat field stone, granite, limestone, sandstone – whatever you can imagine. Manufacturers of manufactured stone facing make special corner stones that wrap around the corner and provide a finished edge, lintel treatments and even mantel supports that look like protruding stones. For ease of delivery, installation and weight savings, I recommend using manufactured or artificial stone. Widely available in many different styles, colors and layout patterns, stone veneer is an enormously satisfying addition to your log home fireplace stone options.